Mt. Everest, the highest peak of the World is the desired destination of each and every human being. Very few people have the opportunity to fulfill this dream in their lifetime. You are really lucky by choosing Everest View Trekking such that you are endeavoring to fulfill that dream. If your desire to be on the summit of Everest and you accomplish this you are great. Nevertheless, being to the Everest Base Camp is also a most challenging job. Never mind, your dream of being atop or afoot of Everest gets fulfilled by Everest View trekking. 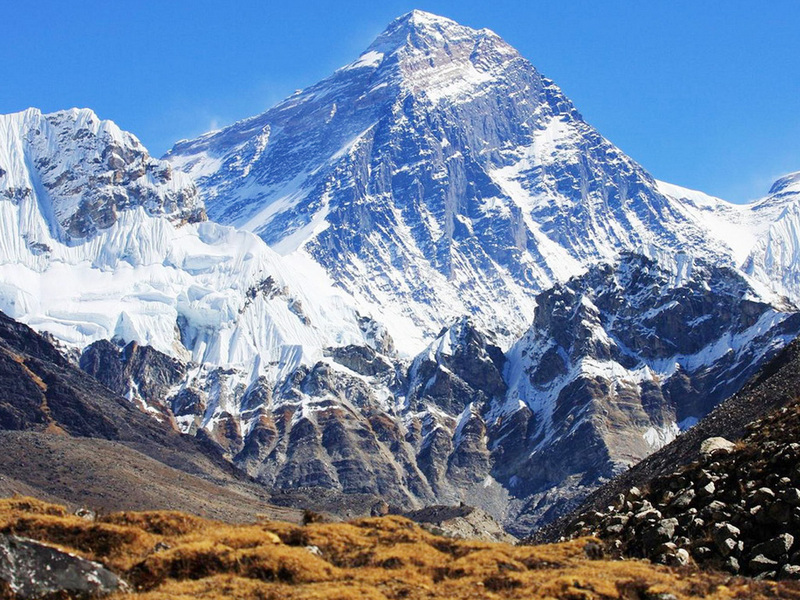 Everest View Trekking is meticulously designed for those who wish to view Mt. Everest in a short span of time and are willing to trek in the low altitude only.This trek, also known as Everest Panoramic trek, is suitable for almost everyone. You will have an opportunity to meet and interact with Sherpa people and learn their culture during Everest View Trek. You will certainly be amazed by experiencing their colorful festivals and pristine rich culture. The other highlights of Everest View Trekking include breathtaking views of the monasteries; diverse flora and fauna; picturesque landscapes, terraced farmland, magnificent snowcapped mountains along with Mount Everest. This marvellous trek certainly makes your holiday memorable for the lifetime. The scenic mountain flight to Lukla from Kathmandu commences the Everest View Trekking. The real trek begins from Lukla. The trekking trail takes you through beautiful settlements and offers you a fascinating opportunity to explore pristine culture of Sherpa people. We will view one of the highest airstrips upon arrival at Syangboche. The trail also offers the views of diverse flora and fauna with admirable Himalayan views. We will end our trek when we arrive Tengboche village (3860 m). Tengboche being culturally and naturally a rich destination offers eyecatching and breathtaking views of Mt. Everest, Mt. Lhotse, Mt. Nuptse, Mt. Kwangde, Mt. Ama Dabalam, Mt. Thamserku, Mt. Kantega. The other highlights of Tengboche include colorful Mani Rimdu, Dumje festivals and the famous Tengboche Monastery. After exploring Tengboche, the trail takes us back down via Kyangjuma village the Everest View trek ends in Lukla. Upon arrival in the Kathmandu Airport (TIA), you will be welcomed and greeted by our representative and then transfer to the hotel. After check in, you can either take rest; hang around in the city as it all depends upon your interests. In the evening, we will organize a Welcome Dinner at an excellent traditional Nepalese restaurant where you will enjoy a Nepalese cultural program as well as a fine meal. After breakfast, break the day with guided tour to several of the most historical and spiritual attractions of Kathmandu. The first visit is made in Swayambhunath Stupa- oldest stupa situated on the hillock. Enjoy the bird eyes view of Kahtmandu Valley and mountains. After then visit Kahtmandu Durbar Square - Palace of Malla and then Shah King of Nepal. Visit Kumari Ghar (living goddes), Kasthamandap (made up of single tree), Hanuman Dhoka (Gate to enter the palace) and many more temples. Finally visit in Patan Durbar Square- city of fine art and architecture. Visit Krishna Temple, Palace square, Mahabauddha, Mahabihar and many more temples and master piece monuments. Late afternoon, there will be a pre-trip discussion where we can meet our trek leader and other team members. Black Diamond briefs us regarding the trip as well as provides us opportunity to ask any questions we may have regarding our upcoming adventure. Overnight in Kathmandu. Early morning after breakfast transfer to Kathmandu airport in domestic terminal to fly over Lukla, a gateway destination for trekking in Mt Everest Region. After 40 minutes adventurous and scenic view flight we reach in the Tenzing Hillary Airport at Lukla. Here we meet our other crew members and then we begin our first day easy trek through forest, villages and along the Dudh Koshi River to Phakding. Today also we follow the Dudh Koshi River and cross suspension bridges many times, one of which is the famous Hillary Suspension Bridge. On the way we can see the beautiful view of Mt Thamserku (6618m). Passing through the small village of Benkar, Chumoa, Monjo we enter in to the Sagarmatha National Park. We cross the last village of Jorsale before Namche and then gradual walk through the forest and bridges until we reach the confluence of Dudh Koshi and Bhote Koshi Rivers (Larja Dobhan). After then about 2 hours steep climb we reach at Chautara from where we get the first sight of Mt. Everest. From there another 1.5 hours easy walking bring us to Namche Bazzar, the gate way to Mt. Everest and the main trading center. After 2 days walking we take a rest in Namche Bazaar to acclimatize the body. It is recommended to stay active during rest day also which helps to acclimatize our body quickly. Walking little high altitude around 100 ft will help to acclimatize properly. Morning we do hike in Thame and later explore Namche Bazzar. After breakfast, trek starts ascending up to the airport in Syanboche which is one of the highest airports on planet. From Syangboche we can see beautiful view of Amadablam and jaw dropping view of Mt. Everest. After then around 2 hours gradual ascent bring us to the Khumjung village which is also known as a second home of Hillary. We explore Khumjung village; visit Khumjung Hillary School and the monastery that houses Yeti scalp. Today our trek starts with gradual ascending to Sanasa. Then continuously descend for an hour till we reach Dudh Koshi River. Crossing the bridge over Dudh Koshi River we then climb steep path for about two and half hours through the lush rhododendron forest, which get us to Tengboche. Tengboche is culturally rich and offer one of the best views of Mt. Everest. Mani Rimdu Festival which lasts for 9 days is the great festival of the Sherpa people, is celebrate here in the month of October – November. Another popular festival is Dumje Festival celebrate in the month of April. Today is the explore day of Tengboche. Tengboche Monastery is the largest and famous monastery in Everest region where Dalai Lama has been visited. The splendid view from here is considered as a best picturesque one in the planet. We enjoy the great view of Mt. 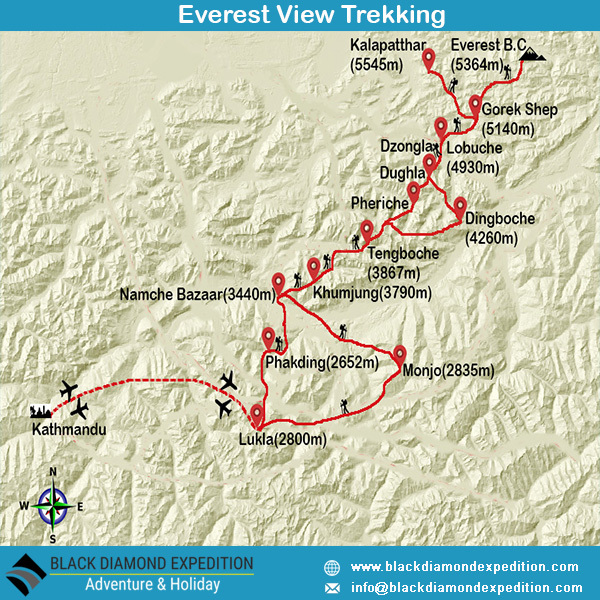 Everest, Nuptse, Lhotse, Kwangde, Ama Dablam, Kantega, Thamserku and many more. We explore the village, interact with locals and explore their pristine live culture and tradition. Late afternoon we visit Tengboche Monastery to witness the Lama puja. After breakfast we leave the beautiful Tengboche village and descend down through rhododendron and fir trees to Dudh Koshi River. We cross the first bridge of today trail in Phungi Thanga and then passing through the beautiful village of Sanasa, Kyangiuma as well as enjoying magnificent view of Himalayas on the way we reach at Tenzing Norgye Memorial Stupa. We may get opportunity to encounter mountain goats, snow leopards, colorful pheasants etc. After then passing by main town of Everest Region, the Namche Bazzar we walk steep down to the Larja Bridge which is the confluence point of Dudh Koshi and Bhote Koshi River. From there the gradual walk along Dudh Koshi River will bring us to the exit point from National Park, the Jorsale village. Another few minutes walking down bring us in Monjo Village. Monjo village is quiet and peaceful place to overnight. Today is our last day of trek. We follow the same route down to Lukla taking enough time to explore attractions on the way, experience Sherpa culture in beautiful villages and enjoying distance view of Himalayas. Upon arrival in Lukla we have plenty of time to relax and stretch the tired body. Late afternoon we can stroll around the Lukla. Evening we enjoy the last dinner with crew members. After early breakfast we fly back to Kathmandu memorizing those excited and beautiful days. In Kathmandu you can take a rest throughout the day in hotel or you can explore other attractions of Kathmandu. For the memorizing the Nepal trip you can buy some souvenirs for yourself or for friends and family in Thamel Area. Late evening we celebrate the success of our trip and enjoy dinner together. After breakfast you are free till departure time. If you have more time you can do shopping or sightseeing around Kathmandu. Approximately 3 hours before your scheduled flight, a representative from Black Diamond drops you to the airport. 3 nights accommodation in Kathmandu with breakfast (Hotel Encounter Nepal- www.encounternepal.com or Hotel Norbu Linka- www.hotelnorbulinka.com) or similar 3-star hotel as per availibility.